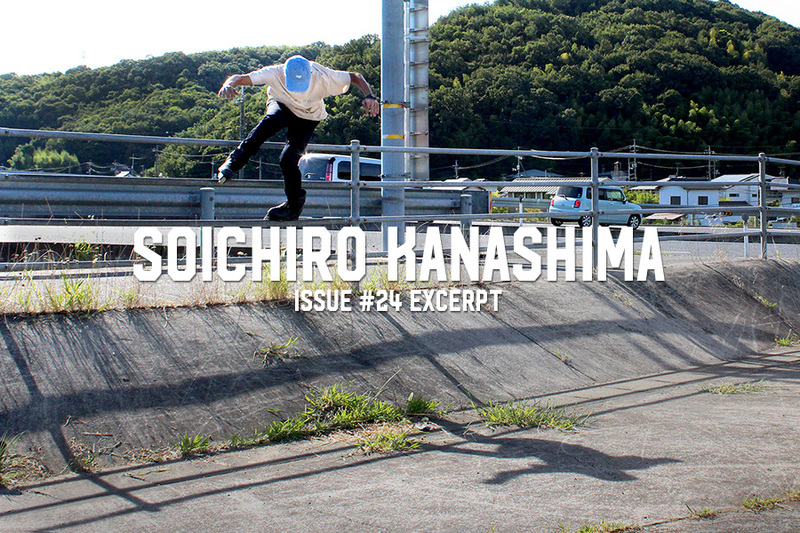 Universally celebrated for his smooth style and flawless execution, Soichiro Kanashima was a welcome addition to Issue #24. In fact, we’ve wanted to make this happen for a long time. Shot on location in Japan by the friends he skates with most often, and with questions by longtime Valo and now Them Goods associate Miguel Ramos, get an unprecedented look into the blade life of one of our generations most popular international skaters. Fair warning: This excerpt is just that, a small slice of the photos and conversation found in the new print mag. So if you like what you see here and want more — we’ve got you covered. Soichiro, do you remember your first time on skates? Can you tell us about it? The very ﬁrst time I skated was when I was 10 years old. I went to DIY Skate Park and jumped on a ramp for the ﬁrst in my life. I remember having so much fun. Ever since, I got into skating and have skated, like, almost everyday. How about explaining MFT — what is it? What does it mean? Back in 2008, I felt like the skating scene in Japan was isolated, that there were less chances to interact with skaters from other countries. So I felt like someone needed to connect them. That’s when I established MFT BRAND, mainly working for broadcasting and clothing. The purpose of MFT is to demonstrate the skating scene in Japan by creating connections with other people by sharing skating videos and photos. When did you take your first trip to America? The ﬁrst time I visited the US was back in 1999, participating in ASA Amateur Finals in Florida. I was shocked and excited because there were so many skilled skaters. How do you see the skating scene in Japan? The one word to describe the skating scene in Japan is “style.” I thinks it’s because of Chiaki’s inﬂuence. Each skater has their own style. Most Japanese skaters won’t be satisﬁed with their tricks if the style is not cool or good enough for them. I really like this about the Japanese skating scene, because they are keen on the small details of skating, even like small movement/position of a ﬁnger. This is the most important part for me when I skate. Give three pieces of advice to young bladers. Try all different kinds of tricks and spots, check how other skaters do, and the most important – ENJOY BLADING! Read & See more in Issue #24 — Available Now!